Over the next few weeks I’m going to post some of my favorite photos. I have over 100,000 digital pictures and videos I’ve taken over the years in about fifty countries. Please feel free to use them for personal use. I hope you enjoy them. 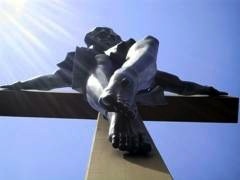 My first is a photo I took several years ago at the Shrine of the Cross in the Woods – the largest crucifix in the world. It is in Indian River Michigan. I love the way the Lord Jesus looked down at me with the rays from heaven pouring down on Him. I will update a hi-res photo when I get home Thursday. Watch for more pictures in the weeks ahead. That is a really good picture.